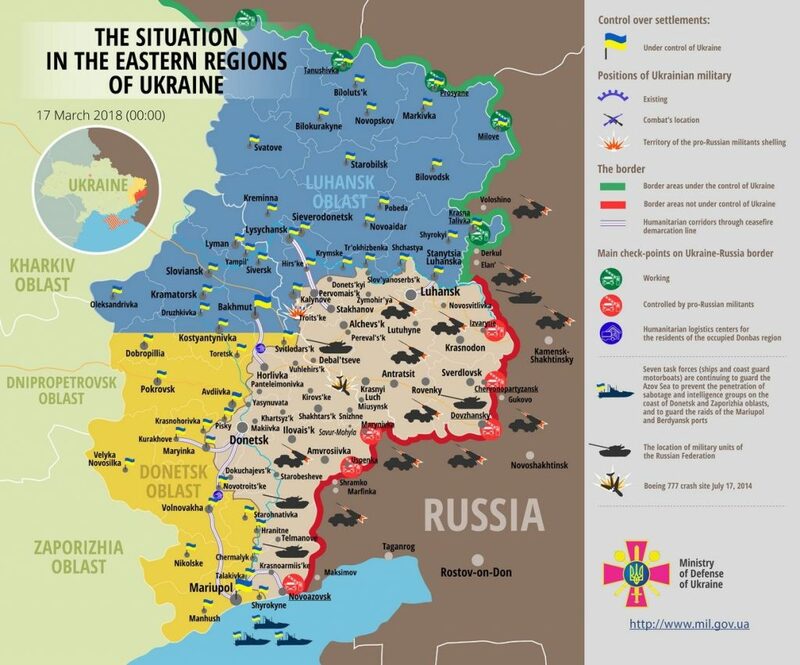 Russia-backed militants committed a single ceasefire violation in eastern Ukraine yesterday. The attack took place in Luhansk sector. “Starting about 21:20, militants were attacking our positions in Troitske with heavy machine guns and weapons of infantry fighting vehicles for an hour. The fire came from the direction of occupied Sanzharivka. Ukrainian servicemen did not return fire,” reported Ministry of Defense spokesman Colonel Maksym Prauta at a press briefing at Ukraine Crisis Media Center. Ministry of Defense spokesman also quoted key points from the statements made by President Poroshenko during his visit to frontline area in eastern Ukraine yesterday, on March 16. “We change the format of this operation. The command over Ukrainian forces goes to the Armed Forces of Ukraine. The [Anti-terrorist] operation changes its format to ‘Joint Forces Operation’,” noted the President. The commanders of the Joint Forces will take command of representatives of military and law enforcement units deployed on the site. The Joint Forces are headed by the newly appointed Lieutenant General Serhiy Nayev. Report on the military developments as of March 16 is available here. Interactive data on the shelling: chronology shelling chart and the interactive map.